This month’s saying on my coffee calendar is “A good cup of coffee is all the luck you need.” Because I don’t have a lick of Irish in me, it is probably all the luck I may find today. But if my ‘green thumb’ prevails, I may start to get lucky with a show of spring flowers soon enough. So speaking green, is there anything coming up yet in your garden? In little warm pockets, you may find some of your grass turning brackish brown to hints of green. But why wait so long to see that wonderful color that should be predominant in your garden. Let’s mention a few quick suggestions for an early green display. A favorite evergreen groundcover, one that I can claim much luck with in my garden is Pachysandra terminalis 'Green Sheen'. This is one of the most sun-tolerant of the Pachysandras. Its green leaves are glossy and makes all your surrounding plants pop. It is deer-resistant and if given the right conditions, it can act as a weed smothering groundcover. The minute the snow melts, and trust me, in New England that can happen quite a few times over the course of a winter, the ‘Green Sheen’ Pachysandra is the earliest sign that there is life under the snow. 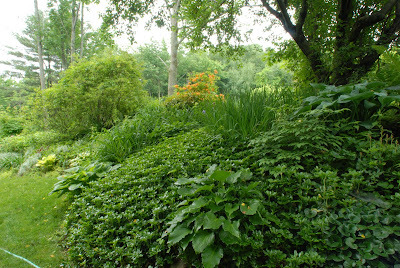 My shade garden has masses of this groundcover and it works well with hostas, ferns and woodland shrubs. You can even plant pockets of daffodils in between the Pachysandra. One other traditional groundcover, Vinca minor is similar to the ‘Green Sheen’ where even under the snow, it continues to stay green. In some areas of the country it is considered an invasive species and must be controlled in its use. Vinca has a soft lavender flower and is drought-tolerant. Once it is established, it is hard to kill, making it a great hardy groundcover. It is an easy plant to move around and get immediate impact. A word to the wise regarding these groundcovers: give them room to spread and don’t plant them around too many delicate perennials. Both groundcovers have the capacity to choke out less aggressive plant materials. Today’s inspirational thought for the day touches upon one of the basic lessons from Annie’s Gardening Corner. “Knowledge is knowing that a tomato is a fruit. Wisdom is not putting it in a fruit salad.”~ One-liner from Irish Jokes.Com. To all my ‘green thumb’ friends, Annie wishes you a Happy St. Patrick’s Day. P.S. Don’t forget to join our Facebook Fan Page. http://www.facebook.com/pages/Bilowz-Associates-Inc-Our-Blog-Annies-Gardening-Corner/325316334444 Lots of extra tips everyday!